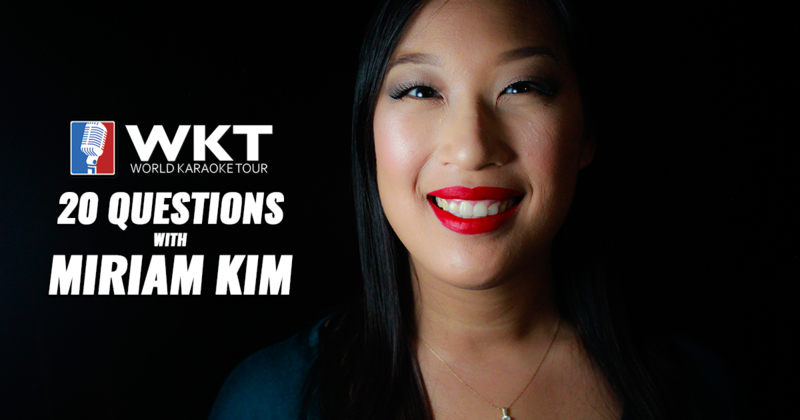 Miriam Kim is the 1st American to reach the World #1 Ranking on the World Karaoke Tour. The California native answers our 20 questions and shares her biggest musical influences and if she still gets nervous on stage. I was born in Los Angeles, CA and grew up mainly in Cerritos and Fullerton, CA. My childhood dream was to become a pediatrician and help little children feel better. Both of my parents were part of the church choir since I was a little girl. My dad was a choir director, and also part of a men's choir that performed concerts around the county. My brother and I were trained in classical instruments since we were young, cello for him, violin and piano for me. I have had many teachers in my life, but my dad would probably be my best mentor. He was the one who taught me to be who I am now and helped mold my personality. His patience, kindness, drive, and resilience motivate me every day. He has always told me to follow my dreams, and to do it whole-heartedly. He is my biggest cheerleader and support to this day. Talent without ambition is like money tucked away in your mattress; it will never have the opportunity to grow because there is no investment. Ambition without talent is like a ship with paddles but no sail; reaching one's destination/goal would take lots of willpower and test one's limits, and if one tires from paddling, the destination will drift further away. I believe both ambition and talent are required to be successful, in any field. With both, talent can grow, while ambition pushes one forward. I am happiest when I see my family laughing and having a great time together, and nothing else fills my mind other than being in the moment with them. Musically, who are your biggest influences? My biggest musical influences are Celine Dion, Whitney Houston, Toni Braxton, and Beyonce. I have studied their performance styles and seen how they can emote a song through just their voices. Not to mention, their presence on the stage is absolutely incredible to watch! Who are your favorite singers, past and present? I have many favorite singers, including those above, as well as Beth Hart, Jennifer Hudson, Kelly Clarkson, Alexandra Burke, Monica, Brandy, P!nk, Luthor Vandross, Brian McKnight, ... so many.... I feel that I enjoy something about most singers because they are unique in their own way, and I appreciate the artistry in music. I most certainly get nervous. I am usually an introverted person, and usually being in the spotlight gives me butterflies in my stomach. I have learned to channel the nervousness into laser focus on the music and my performance, after which, I end up collapsing once I'm off the stage. I have learned not to show it on my face and just continue on with the line or phrase in the song. The show must go on, and usually, people don't even realize a mistake has been made unless they know the song really well or see the panic on the singer's face. Even if it's a mistake, I like to play it off that it's all intentional. I love playing with makeup. It allows me to express myself physically, which in turn, helps my psyche create a character when singing. If you could record a duet with any singer, who would it be? I would want to sing with Vincint Cannary from The Four. His presence, voice, and attitude are everything I look for in a duet partner. When you are not on stage performing, what do you like to do for fun? I enjoy spending quiet time with my significant other and/or hanging out with a small group of friends. Ok, don't judge me, but it would have to be "Pony" by Ginuwine. There is just something about that song, that can get me out of my shell and have me dancing and laughing. Yeah, baby!! Perfectly-timed play on words. I appreciate the cleverness and intellect that goes into wordplay. I don't really watch TV, but I love watching Once Upon A Time and my Korean Dramas. If I do, it's been kept a secret from me these 35 years. To keep trying. Failure is inevitable, but if I stop after one failure, I would not be enjoying what I have achieved in life thus far (such as my education, my work, my relationship)... or be answering these questions. LOL! What advice would you give to singers who are looking to improve? Consider what kind of artist you would like to be. Study those who have come before you. Work on your technique. Discover your vocal range (chest voice, mix voice, head voice, falsetto). Choose songs that fit your voice, not the other way around. Try different things with your voice. Perform in front of a mirror. Create your musical "alter-ego". But most of all, have FUN doing it all.